So, you’re ready to reap the rewards of fast internet for your business? For details on each of these benefits, check out The Top 5 Advantages of Using Fiber Internet for Business. While fiber is fairly foolproof once you’ve got it installed, there can be challenges and unwanted surprises with any major technology-based change. To help you unlock the smoothest and most positive changeover experience possible, we’ve curated a list of 8 questions you should ask any prospective internet for business provider. Fiber-optic internet connectivity is less expensive than you think. In fact, our prospective clients are typically surprised when they find out that fiber is not as expensive or fairly close in price to their current internet connectivity solutions. Why is this? Generally, providers of DSL/Cable internet for business are paying to maintain an enormous network, which includes hardware and infrastructure as well as agreements with local vendors. These costs are passed on to their client's monthly data bills. Fiber is an inherently simpler technology in many ways than cable or copper-based internet connectivity. You’re not paying for a complex infrastructure or shared bandwidth with public internet users, you’re just paying for your own bandwidth. All of that said, the initial costs of fiber adoption can vary significantly and largely depend on factors surrounding the initial installation. If there’s a fiber line close to your business, your costs will be lower. Don’t dismiss fiber simply because you think it’s more expensive. Chances are, it’s not. More importantly, don’t forget to ask about installation costs in addition to an estimate of your monthly bill. 2. How Fast Is It, Really? 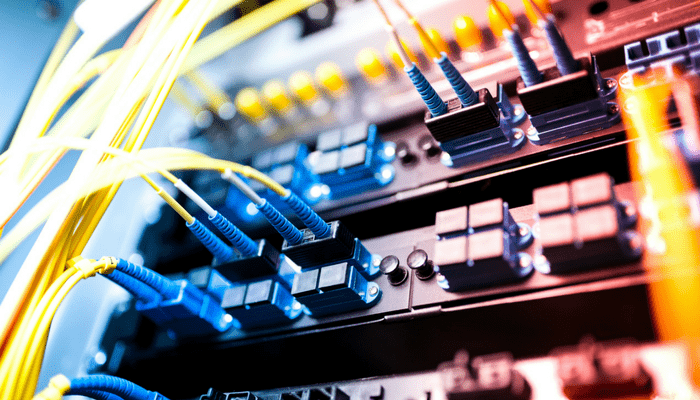 Even if your business transmits a LOT of data, you probably won’t run into any speed or latency concerns with fiber-optic internet connectivity. More specifically, the speed of fiber internet varies according to the specific electronics. Generally, the maximum speed with the right equipment can reach 100 GigE, but more commonly, at least 10-1000 Mbps. In non-tech terms, that’s approximately ten times or faster than the best copper-based circuit money can buy. 3. How Much Bandwidth is Guaranteed? With traditional approaches to internet for business, it can be very costly to upgrade your bandwidth. Depending on your infrastructure, many companies have to install new equipment and circuits. Fiber’s a lot more flexible, offering companies the ability to add bandwidth as-needed and scale up seamlessly. All it takes is a phone call to your provider, who should be able to immediately modify your settings without any on-site visits or installation projects. The determining factor in bandwidth limitations with fiber is your Ethernet port, which accommodates certain amounts of Mbps such as 10, 100, or 1000 Mbps. If you’re concerned that your monthly internet bill will contain lots of hidden charges, rest assured this is very unlikely, especially with an ethical provider. Fiber isn’t charged by the amount of data you use, and your service charge should not fluctuate from month to month. Whether or not your voice circuit crosses state lines. 5. Does the Contract Lock You In? Fiber internet contracts typically include a 12-month commitment at minimum. This approach is fairly standard in the industry, since the initial cost to the provider can be high and the one-year commitment from clients allows them to recuperate costs. Contract flexibility can vary between vendors. It’s always wise to have an honest conversation with prospective providers before you commit about your options to change your contract, including adding or subtracting other cloud-based communications tools from their services menu. 6. Can My Systems Fully Use Gigabit speeds? Your router’s capabilities determine whether or not your employees can use wireless internet connectivity (WiFI). In general, your provider should enable you to provide WiFi in the workplace by guiding you to the right commitment and helping you add a wireless access point to your local area network (LAN). In rare cases where this isn’t possible or needed, as your provider about the possibility for cost savings by inquiring whether they let clients pay for a bottleneck on data. 7. Is Fiber Available In My Building? Your proximity to a fiber ring is the biggest factor in determining the initial cost of installation. One of the first steps to switching your data is talking to prospective vendors about availability. In many cases, you can also use their online fiber availability maps to determine whether fiber is available in your area. If your business is in the process of moving, you’ve got an advantage. Work with your future landlord and realtor to make sure your lease includes a stipulation that fiber will be available on-site, which can allow you to pass installation costs on to the property management company. If you’re a commercial landlord or tenant, check out this insider’s guide to the fiber installation process. 8. How Much Will It Cost to Install Fiber Internet for Business? How close is the nearest lit fiber or dark fiber? What kind of existing conduit does your building have? Does the fiber installation need to cross physical obstacles such as highways or railroads? Does getting required approval for fiber installation require me to navigate many layers of bureaucracy? Is there enough space available in our telco closets? Is there sufficient power for fiber technology? How many different paths to the building can the fiber cable take? To take an in-depth look at how each of these variables can affect cost, check out How Much Does it Cost to Get Fiber Internet Installed in My Building? There’s little question that fiber-optic internet for business can offer some pretty immense benefits in terms of long-term costs, reliability, security, flexibility, and much more. By bringing the baseline of your communications systems into the future, you can elevate the quality of your cloud communications and achieve agility in adding cloud services. While you may be sold on the fact fiber is right for you, it’s common for prospective business fiber users to have many questions about the costs, processes, and timeline they’re looking t for installation. That’s common, and knowing the right questions to ask vendors is the best way to ensure you have a positive experience from start to finish. Fiber internet for business with Atlantech Online offers the advantages of unmatched customer support, a proprietary network, and unbeatable pricing. To learn more, click here to learn if fiber is available in your building, or click here to start a conversation with an Atlantech expert today.